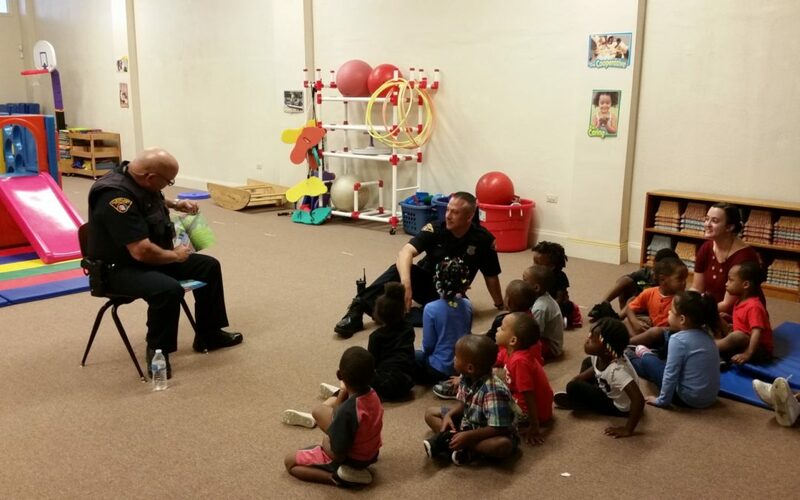 Members of the Cleveland Police Department played with a doll house, explored the classrooms and read to the students at the Council for Economic Opportunities’ Villa Head Start center this week, kicking off another year of the Friendship through Reading program. The program is a collaborative effort between the Cleveland Police Department and the Council for Economic Opportunities which aims to foster positive relationships between the officers and the community. Sergeant Wilson and Officers Tomaro and Butcher read to the Head Start students and talked to them about safety in and out of the classroom. After they were done reading, Officer Butcher played with the doll house with some of the children, while Police Officer Tomaro explored the classrooms and engaged with the children with science viewers. Officer Tomaro also showed the students his police radio. The officers also took the children outside and let them take turns getting in the patrol car and talk on the loudspeaker. They also got to see the lights and sirens. The Friendship through Reading program will continue this year at all 13 of our high-quality Head Start centers across Cuyahoga County.